In this tutorial we illustrate the effectiveness of the PSY procedure in detecting bubbles with an applications to the S&P 500 financial market using R and the psymonitor package. Before beginning the tutorial, make sure that you have all the necessary packages. Try running the cell below and, if any issues arise, follow the instructions within. In the presence of a speculative bubble, asset prices characteristically deviate in an explosive way from fundamentals, representing exuberance in the speculative behavior driving the market. 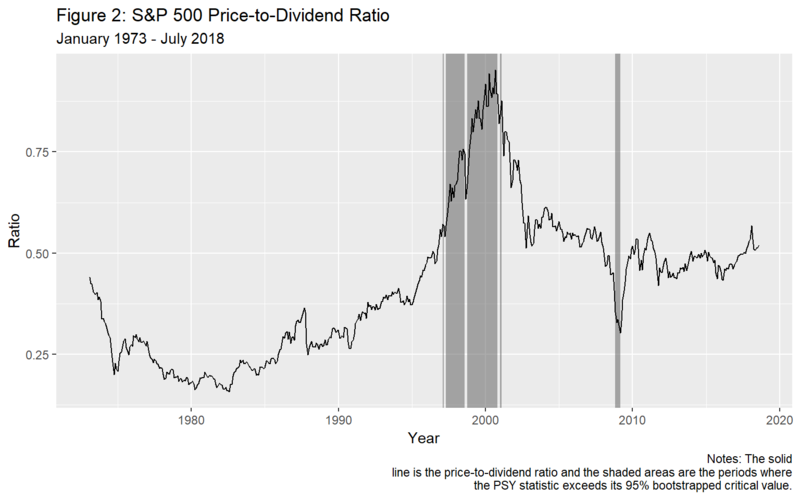 In the present case, this deviation implies that the log price-dividend ratio is expected to follow an explosive process over the expansive phase of the bubble. But during crisis periods, the price-dividend ratio is expected to follow a random (downward) drift martingale process, in contrast to a small (local to zero) constant drift martingale process that typically applies under normal market conditions. According to the theory detailed in Section 3 and 4, we expect to witness rejection of the null hypothesis in the PSY test empirical outcomes during both bubble and crisis periods. 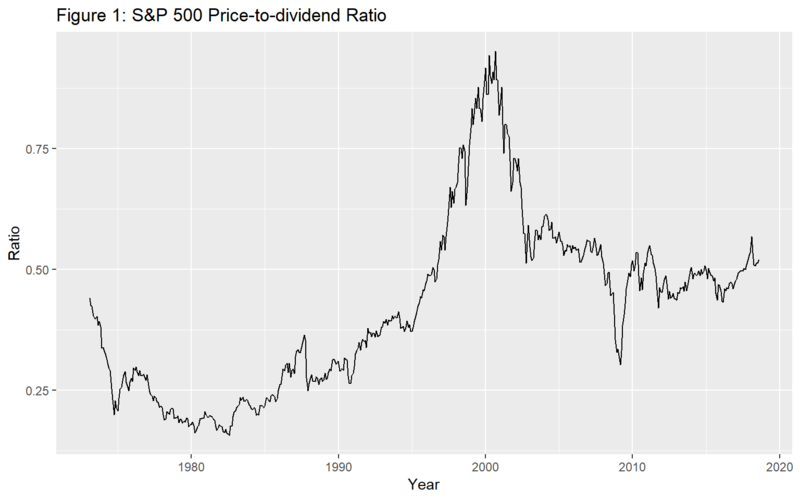 Figure 1 plots the price-to-dividend ratio of the S&P 500 index. We observe a dramatic increase in the data series in the late 1990s, followed by a rapid fall in the early 2000s. The market experienced another episode of slump in late 2008. Next, we run the test and simulate critical values via the bootstrap. quantilesBsadf <- cvPSYwmboot(y, swindow0, IC, adflag, Tb, nboot, nCores = 2) #Note that the number of cores is arbitrarily set to 2. Identified periods that last more than a month are shaded in Figure 2. As is evident in the figure, the procedure detects two bubble episode and one crisis episode. The first bubble episode only lasts for two months (1986M06 and 1987M08) and occurred before the Black Monday crash on October 1987. The second bubble episode is the well-known dot-com bubble, starting from January 1996 and terminating in October 2000 (with several breaks in between). For the dot-com bubble episode the identified starting date for market exuberance occurs well before the speech of the former chairman of the Federal Reserve Bank Alan Greenspan in December 1996 where the now famous question `how do we know when irrational exuberance has unduly escalated asset values’ was posed to the audience and financial world. The identified subprime mortgage crisis starts in October 2008, which is one month after the collapse of Lehman Brothers, and terminates in February 2009. Phillips, P. C. B., & Shi, S.(2017). Detecting financial collapse and ballooning sovereign risk. Cowles Foundation Discussion Paper No. 2110. Phillips, P. C. B., & Shi, S.(forthcoming). Real time monitoring of asset markets: Bubbles and crisis. In Hrishikesh D. Vinod and C.R. Rao (Eds. ), Handbook of Statistics Volume 41 - Econometrics Using R.
Phillips, P. C. B., Shi, S., & Yu, J. (2015a). Testing for multiple bubbles: Historical episodes of exuberance and collapse in the S&P 500. International Economic Review, 56(4), 1034–1078. Phillips, P. C. B., Shi, S., & Yu, J. (2015b). Testing for multiple bubbles: Limit Theory for Real-Time Detectors. International Economic Review, 56(4), 1079–1134. Developed by Peter C.B. Phillips, Shuping Shi, Itamar Caspi.